EXERCISE: To define and interpret features that distinguish a recognizable face. 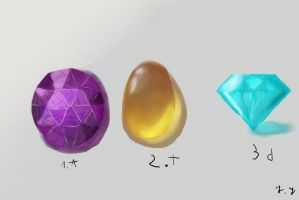 Outline - Begin with the shape of each gem, do research if you're looking for a specific cut! Try to do this on a separate layer to hide in step 4. Solid Base - Choose a color and try working in a darker value shade of that hue. Color Variants - This is when we start to create the illusion of faceting, when each "plane" of a gem will catch the light and reflect it at a slightly different value of that same hue. Think about where the light source is coming from as well. 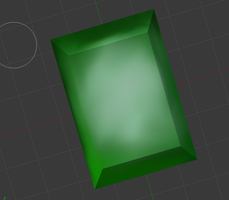 Remove Outlines and Add Gradients - This will give the gem a solid foundation from here to detail further! Subtle gradients will add that extra touch of realism. Sharp Angles Brush - The intense sharp angles that are seen in gems can be recreated with an angles brush set to overlay or multiply. You can download our brush HERE. Highlights - Work along the edges of the different facets and this will give the gem a sense of realism along with separating the planes from one another. Detailing and Polishing - Add any final detail and "polishing" to give your gem an extra something to make it stand out. I also like working in the shadows and pop in some color. How I add gradient? Need to Select and add gradient in every part? Or are simple method? This was fun! Great tutorial! How'd I do? Definitely going to try the other gems! I need to create a tutorial folder. These are really cool! I see that gradients were used. Did you use any? Just as. Thank you for this wonderful exercise! I gave it a try, and I'm pretty happy with the way it turned out! ^.^ (My results: Gem Shading Exercise). Thank you again for your fantastic resources! Wooow so good!! I have the first one! is there a way to use ur brushes in sai? thx! Awwww, I feel I need to watch you... Your schematic structuring manner is wonderful! Now, I used this tutorial for something im making in Paint tool Sai and I dont get step 4 can someone give me a brief tip for that one? So basically blend out the colors/lines with appropriate colors of that gradient? A very instructive and useful tutorial. Thank you very much! Great exercise! Here is my result (even though it's not full) kseniyakinaru.deviantart.com/a… Thank you so much for your tutorials! Thank you so much for these fantastic tutorials!